God knows I love the Sun City Girls’ label Sublime Frequencies and their essential collections of raw, authentic music from around the globe. The Trikont label is a close second in this sparsely populated field and this collection of rambunctious, hypnotic music may be one of my favorite albums these days. 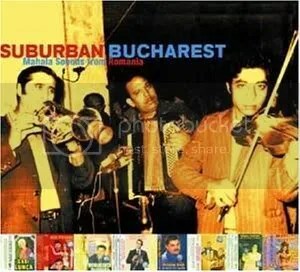 Some of the tracks are sort of fit my unfair stereotype of Romanian music: forlorn vocals, sad string arrangements and impassioned fiddling, but I have been proven hopelessly wrong as usual. Admittedly, about half of these tracks do fit into my preconceived box, but the other half offers discoveries on par with the moment I discovered Mogollar and Erkin Koray and realized that Turkey was responsible for some of the best psych of the 60s and 70s. The first track “Iag Bari” by Dan Armeanca and Fanfare Ciocarla incorporates Indian and Latin influences and the end result is a trippy whirling dervish that is replete with a repetitive horn section that push his pleas into overdrive. Dan Armeanca provides another highlight with “Can Marraulan” which draws from Middle Eastern inspirations as Dan’s vocal performance is a passionate tour de force. Dude could be singing about torturing houseflies and I wouldn’t care an iota. A few tracks sound like a bad Bollywood production, but the majority of these tracks provide a welcome introduction to the sounds of Romania.